I forgot how quickly they trotted this thing out after the band broke up. I also can't believe this came out over a decade ago. The time flies, etc. 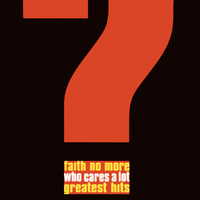 So, yes, a Faith No More greatest hits comp. Of course, any self-respecting fan of the band would own all of their records, so their label did what any label does: they threw together a bonus disc of unreleased songs, included it with the compilation, and successfully got fanboys like me to shell out money for 15 songs I already had just to get to eight I didn't. We were excited when we heard there was going to be a "rarities" disc; less excited when we found out it wasn't a full disc (less than 30 minutes); even less excited when we saw the track listing. It's never a good sign when there are songs called "Hippie Jam Song" and "Instrumental." The bonus disc ended up being almost a complete bust. Three of the songs are live (though not listed as such, and two of those are barely over a minute long), one of them is an early demo that's sandwiched between much newer stuff, and the two unfortunately titled aforementioned tracks don't have much to offer. Thankfully, "The World is Yours" and "I Won't Forget You" are solid tracks, both seeming to be roughly Angel Dust-era or a little later. The thing that makes this disc even more disappointing: the band has a solid collection of actual b-sides to pull from. Slap 'em all together and you've got yourself a whole 'nother Faith No More album. Believe me, I've done it. Two things that have always really bothered me about this one. Thing #1: The bonus disc is only 7 songs. Are you kidding? This for one of the most frustrating bands for completists and all you give me is 7 songs? Now true, these were all unreleased but still, throw on about 13 rare b-sides, live tracks, or at least interviews. Something. Thing #2: Absolutely no song information. What guitar player is on which song? When were they recorded? Where? For an album? Single? For a nerd that is the stuff I want to know. That being said I pretty much agree with your review. "Highway Star" is pretty insane but did we really need a live version of "Midnight Cowboy?"